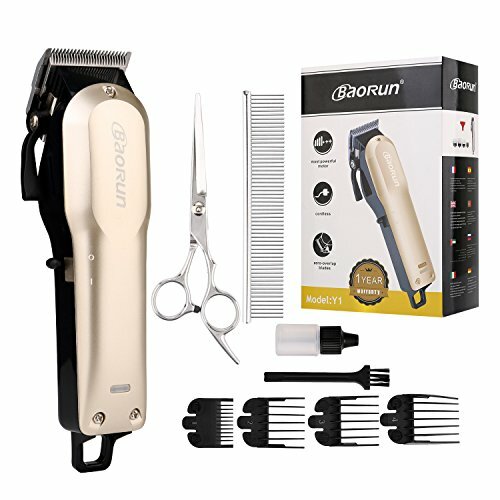 HIGH PERFORMANCE PET CLIPPERS: The BaoRun heavy duty dog clippers come with self-sharping blades for snag-free cutting. It uses high power motor, which makes the clipper ideal for cutting thick coat. Just for a safe, easy and comfortable grooming experience! LOW NOISE OPERATION: The professional dog clippers use low noise operation design to guarantee a stress-free grooming experience for most dogs, cats, rabbits and horse. CORDLESS and LARGE CAPACITY BATTERY: Thanks to its cordless and 2000mAh battery design, you can use the cordless dog clippers everwhere you like. The battery is without memory function, so you can charge it any time without worrying about the battery. WHAT YOU GET: Inaddition to the professional pet clippers set, you can get 1-year warranty to the Baorun Y1 heavy duty pet clippers. If you have any issues with the pet grooming kit, just contact us for a replacement or refund. COLOR Box PACKAGE: We use color box package for this product, so it's not only for private use, but also ideal for gifts to your friends and family. If you have any questions about this product by Baorun, contact us by completing and submitting the form below. If you are looking for a specif part number, please include it with your message.